I know. Like a woman in her first trimester of pregnancy it makes some folks uncomfortable to publicize good news too early. But there comes a time when recognition is not just appropriate, it’s overdue. I believe we have reached that time now. Our employees heading home in the same condition in which they showed up. Their families enjoying their health as well as their paychecks. Our customers seeing better quality, continuity and performance on a daily basis. Zero workers’ compensation claims and the lowest possible insurance rates. No costly retraining/light duty/lost productivity due to safety concerns. In a word we’ve had the luxury of focusing on our customers and our business without the extra costs, distractions, and morale penalties that come along with unsafe work environments. Have we been lucky? You bet. Plus we do “light” manufacturing so the risk is lower than other shops. Still, luck isn’t accidental, so to speak. 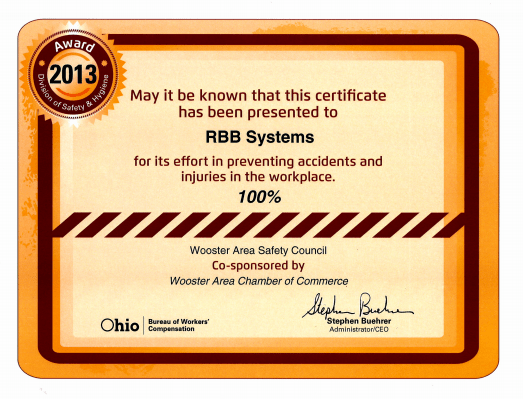 RBB’s safety program is simple and straightforward. We have a small employee committee who meets regularly, stays informed of new regulations and best practices, and whose members make themselves available immediately should a problem arise. Near-misses are wrestled to the ground fast – averting the source of the risk is the RBB way. Management doesn’t dicker over identifiable safety matters. Our safety program is weak on fanfare and strong on prevention. We quietly but doggedly educate our people, listen to their concerns and work safely one day at a time, leaving the safety hoopla to others. To many manufacturers the Occupational Safety & Health Administration (OSHA) is best kept at arm’s length; we invite OSHA to tour RBB annually.Who better than OSHA to keep RBB abreast of health and safety news? Our safety committee members bird dog their walkthroughs and get really great ideas on ways to eliminate workplace hazards. 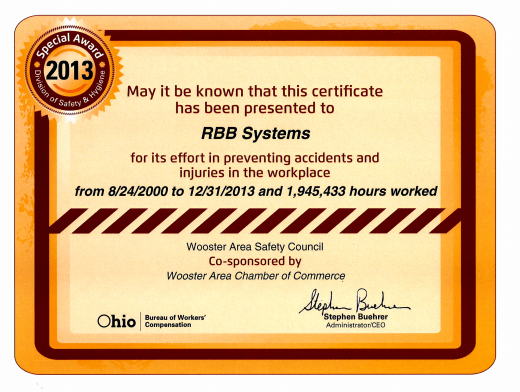 To put things into perspective, RBB hit another safety milestone last month: 2 million hours worked since that last lost-time injury. This equates to 68 full time workers over the 14 year period. Along the way we’ve on-boarded dozens of new employees – who are often those most at risk of injury. In my view the 2 million hours is an even greater testament to our employees – the ones who put in the hours every day. No story about RBB’s health and safety is complete without recognizing the steady hand of leadership of Ross Lilley. Ross is celebrating 41 years of dedicated service and his achievements are too numerous to count. In addition, he was a founding member of the Wooster Area Safety Council and has helped introduce better working conditions to companies throughout our community. In many ways he is the true face of RBB. Thank you Ross for your steadfast and thankless service! I can’t remember the last time I read a company’s stated Core Values that did not include the well-being of their employees in one form or another. It becomes almost too easy for leadership teams to say this… and then get back to the “real” work. The old Chinese proverb states, “The best time to plant a tree is 20 years ago; the second best time is now.” It is our hope that everyone reading this takes one tangible action to plant your safety tree today.